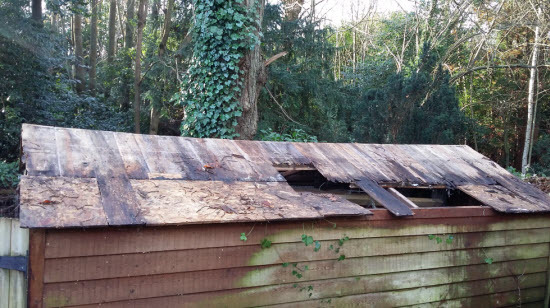 Is it worth repairing a shed? Will your shed repair service work for my shed? The short answer is..... it depends. For a shed repair to be viable it has to make commercial sense to you (ie the repair should cost less than having the shed completely replaced). I frequently find that repairing sheds of a reasonable original quality (not the super cheap B&Q variety) is often a winning proposition. Quite extensive repairs to the roof or base can be undertaken. The main area of cost in shed construction is the walls and these often are much less affected by wind and weather than the roof and floor/foundation. This shed roof looked in a terrible condition but replacing it with a new flexible membrane was much better value than replacing the whole shed! Also having a shed repaired is often less disruptive overall than having a new shed. So a repair along with some additional remedial measures can give you back the dry, sheltered space in your garden that you need. What follows is a bit about me and my skills and how the shed repair service works. If you find this a bit boring then skip straight to the page where I show lots of examples of the unlimited types of repair that I can undertake. I am based in Tunbridge Wells and normally work within a 20 mile radius of the town. I can be enticed to travel further so if you have a job you think might be of interest please get in contact. I am a Chartered Civil Engineer, who after 30 years designing structures ranging from bridges, offices, shops, flats and houses, decided to combine my professional skills with a self-trained interest in carpentry. As well as using a wide range of modern power tools I also have traditional woodworking skills. 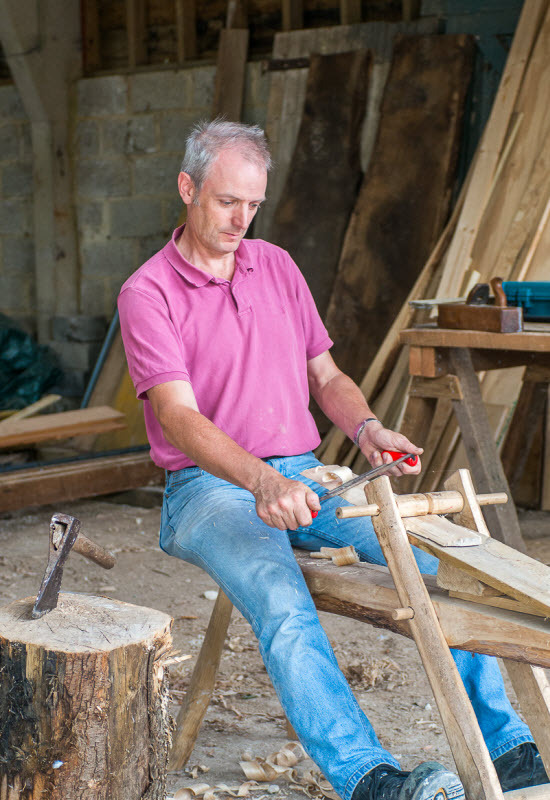 This is me using a drawknife and shave horse to create some sweet chestnut shakes for a roofing project. So now rather than just working behind a desk designing large projects. My shed repair service allows me to work on some really quite small projects but undertake the whole project: from design, through implementation to completion. The transition started in 2008 with the creation of this website which has expanded over the last 11 years so that now it reaches over 40,000 people per month. 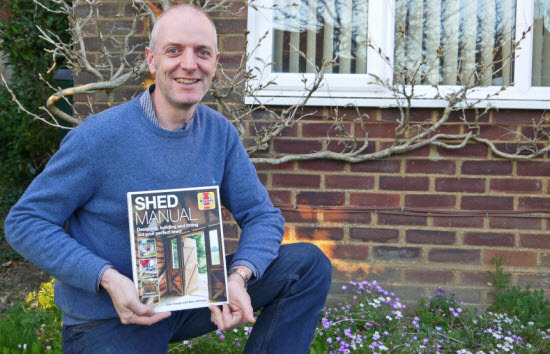 In 2017 I was approached by the publishers Haynes to write a Shed Manual, in the same sort of vein as their classic Car Manuals. I wrote the book during 2018 with Alex Johnson of the blog Shedworking. Alex wrote the literary bits whilst I built the sheds, shot the step by step photographs and wrote the instructions about how to build four very different types of shed. I started the shed repair service and bespoke shed construction by offering it to friends and family. I now offer this more widely and you can see this in the shed projects section the type of problems that I am presented with and the solutions I have developed. My aim for each project is to use good quality, appropriate materials for the situation. Often this involves replacing or repairing with similar materials, but often I can offer a solution that is better than the original. Examples include using EPDM roofing material which has a much longer life than the more widely used roofing felt, also in the right situation recycled plastic bearers are a much better option than even pressure treated timber. 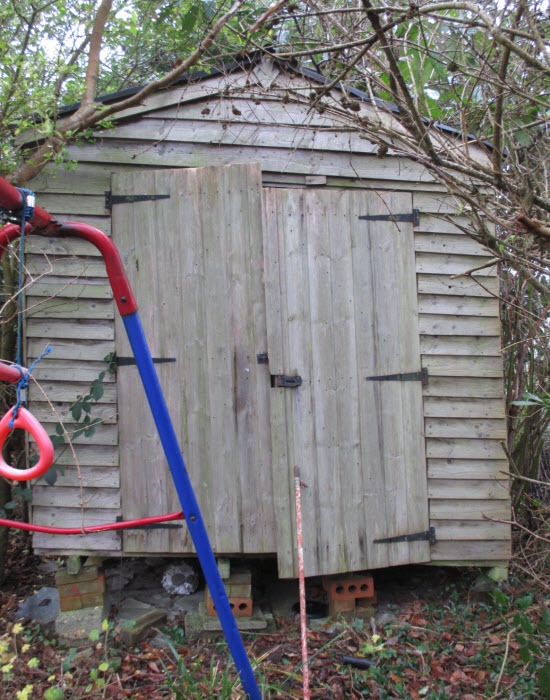 How does your shed repair service work? The first step is to contact me via the contact form below, remembering to leave your contact phone number. I can give you a call and we can discuss your problem and see if there is a way that I can help you. Dependent on the type of work that is required I can sometimes prepare a fee quotation based on photographs that you email through. More often I will need to visit to inspect the shed and we can discuss the work that you would like done. I can also make recommendations at this stage as to materials or solutions that would be appropriate. After the site visit I will prepare a fee quotation describing the work that I propose to undertake and identify areas that are outside of the scope of the repair. The amount of the fee quotation is generally broken down into two parts for labour and materials. If you decide that it makes sense for you to go ahead then I can advise an indicative starting to date. To confirm your order I require payment for the materials element of the project in advance. I can then procure the materials needed so that they are ready for start on site. Most shed repair projects are of short duration so once I have completed the agreed work the labour element of the payment is due. I offer a fairly unique shed repair service which is a combination of design and practical skills that will quickly restore your shed back to the space that you need, for whatever use you put it to. I am continually coming up with new and innovative solutions so even if you don't see exactly what you need give me a call or drop me a line.